Part of the Russell Property Group Portfolio in Tapora Street in Auckland’s CBD this space presented exciting opportunities for both Wherescape and the Stack Design team. 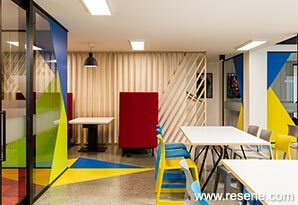 WhereScape needed a new office space that reflected their fun vibrant nature yet was also suitable to entertain their corporate clients. Uniquely, it also needed to deliver a ‘one company’ feel. The resulting semi-industrial space achieves this. In their previous office space, WhereScape’s staff were split between floors and buildings, giving the company a disjointed team environment. Additionally the company had two distinct sides to its business. The data-focused engineers who required a quieter environment, and the energetic marketing team who needed a more collaborative setting. The main project challenge was to allow the different groups to work in their own way but to give them places to interact and socialise creating the needed feeling of unity. 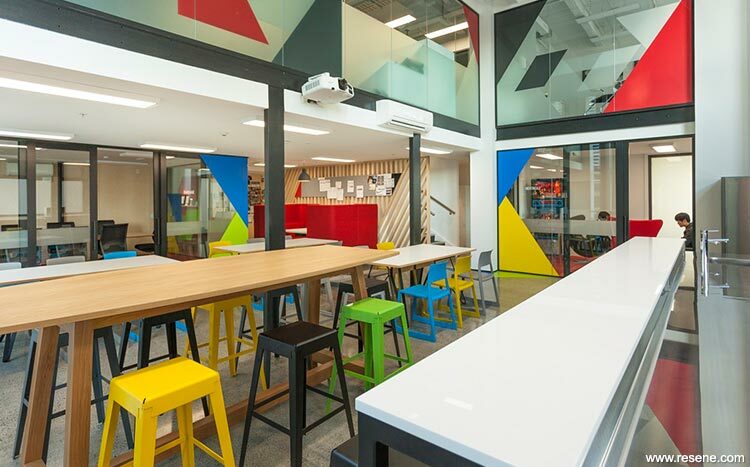 The final result saw Stack’s team utilise the space well by using an upper level mezzanine creating double height spaces with vibrant colours throughout. 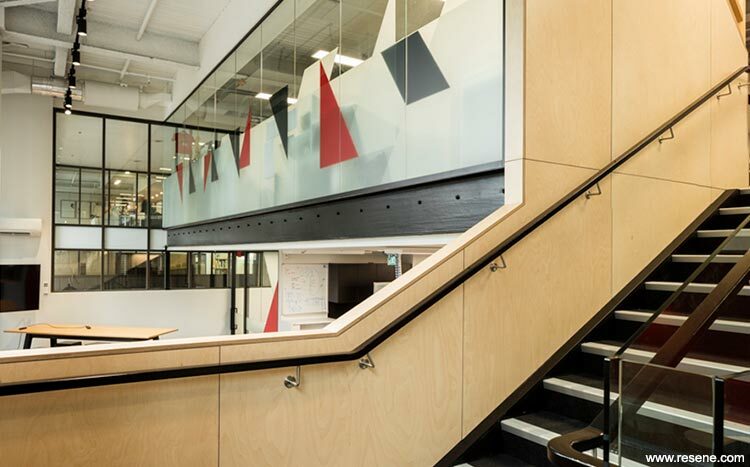 A main central staircase links the two levels and a northern double height café space opens to the outdoors. 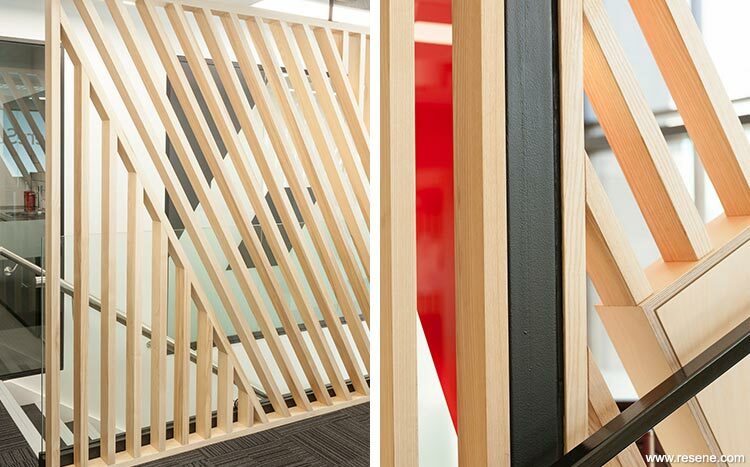 The new office now brings together the teams delivering the ‘One Company’ result they desired. With the industrial nature of the space being something that needed to be celebrated in the design, the Stack team strongly felt the need to lean towards a neutral grey palette combined with red Resene Jalapeno, Resene Black White and Resene Black. 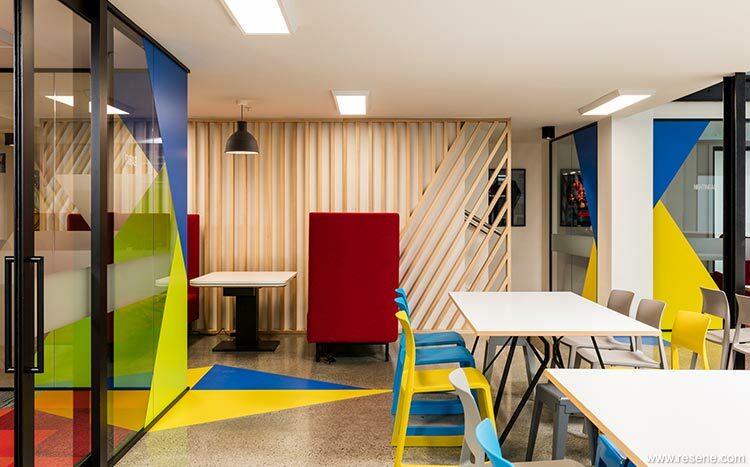 Not only is red part of WhereScape’s brand colours, this also created a vibrant contrast to the industrial nature of the space alongside the warmth of the timber panelling. Resene Write-On Wall Paint has been used on the walls in collaboration areas to help staff share ideas.